I did go visit the Mitchell fire burning in the Deep Creek Mountains of SE Idaho yesterday. Earlier story (which prompted my visit). A violent thunderstorm came up just about as I arrived. I ate a lot of dust and smoke. 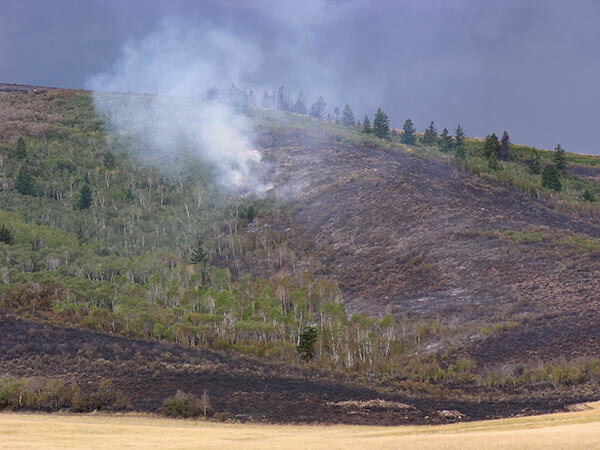 The storm redistributed the fire, which was burning in heavy fuels up the west side of Bull Canyon into higher and higher country. A lot of rain dropped near the head of the fire, which will hopefully help bring this under control. The fire is mostly burning native grasses, aspen, chokecherry, mountain mahogany, bitterbrush, sagebrush, and pockets of fir. This is great wildlife habitat. The “heavy fuels” should not be interpreted to mean the area needs to burn. There was little or no cheatgrass and the area ought to regenerate well (my opinion) if they can keep off road vehicles off the fire lines they have constructed. The fire was started from sparks generated by a combine (ag equipment). I put up some photos on Google Earth. Those are some good photos of the sky and the Deep Creek mountains, Ralph.